$2.1 billion investment would include tourist resort and a new PA city near Jericho. 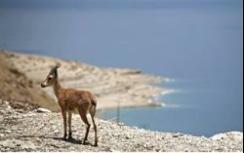 The Palestinian Authority has asked Israel for permission to build a huge tourist haven on the shore of the Dead Sea, according to reports in Persian Gulf press. If approved, the project would give the Arab entity a solid foothold in the Jordan Valley region, considered critical for Israel's security even by many centrists. Netanyahu has said that the IDF would have to be stationed along this area even in the event of a Palestinian state. The plan calls for a $1.4 billion investment in a tourist resort project on the Dead Sea shore and another $700 million investment in the creation of an Arab city south of Jericho. Most of the area that the PA is requesting is currently under full Israeli control and not in the area controlled by the PA, giving rise to speculation that the desire for annexation of Israeli controlled land is behind the plan. The Oman Times said that Israel's Defense Ministry confirmed that a request of this nature was filed by the PA. PA sources said that they doubted whether Israel would respond positively. The Palestinian Investment Fund, which is behind the plan, said that economic projects being advanced with Israel do not replace the diplomatic moves, but offer the necessary economic infrastructure for a future PA state.